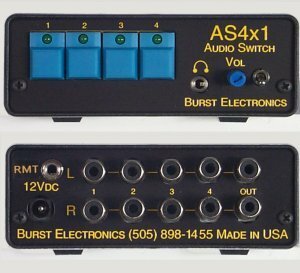 The AS4x1 is a four stereo input, one stereo output audio switcher. The AS4x1 includes an internal monitor amp and speaker. The monitor amp can drive external headphones or stereo speakers. There is also a peak LED indicator for each channel to guard against input overload. 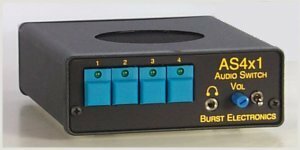 The 50 kHz bandwidth and 85 dB S/N assures clean audio. The inputs and outputs are unbalanced line level type with phono (RCA) connectors. Can be slaved with the VS4x1 Video Switcher to allow audio follow video and breakaway switching. RS-232 remote control option (2400 bps, 8N1). Options: Rack mount, Model KB keyboard remote (contact closure). Model AS4x1R includes RS-232 remote control. Rack mount available, holds four units side by side. Model RM4.